You will earn 358 Reward Points. Earn 1 reward point for every 1 dollar spent. Wells heavy-duty, top-mount, drop-in, round food warmers are designed to hold heated foods at safe and fresh serving temperatures. 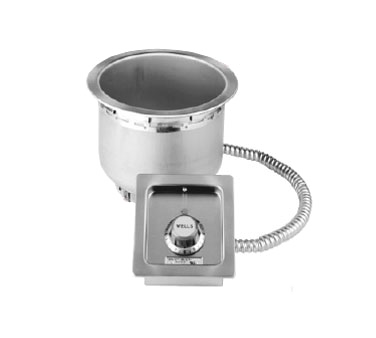 Wells SS4 Series accommodates standard 4-quart round inset pans, and are designed for wet or dry operation. Insulation -Choose between models that are fully insulated around the sides and bottom or standard non-insulated models. Fully Insulated models save energy and may be installed in nonmetal counters. Construction – One-piece stainless steel top flange and heavy-gauge, deep-drawn stainless steel warming pans are standard features on all models. Wellsloks™ are standard for quick and easy installation. Controls & Heating- Models with thermostatic or infinite controls are available. High-limits prevent overheating. Temperature-ready indicator lights are standard on all control types. Powerful tubular heating elements are located under the warming pans for quick and efficient heating and for even heat distribution.